The two-handed strong attack dance can be performed with a broken weapon, but the buff will not work. The dance must be finished for the buff to take effect (signified by an aura spreading out). A good spot to farm Channelers for this weapon is the second bonfire in The Duke's Archives (called "The Duke's Archives" in the Warp menu) after the path to the Crystal Cave has been opened. From the bonfire, head right to the new passage and climb up the ladder. Near the rotary stairs are two of them. R1 Quick thrust attack. Can be done with shield raised. Roll — R1 Overhead chop. Backstep or Run — R1 Running thrust attack. Forward + R2 Jumping thrust attack. L2 (left hand) Quick thrust attack. 1-handed strong attack is replaced by a drilling thrust that hits three times (one normal hit plus two more from the rotating head). 2-handed strong attack is replaced by an area of effect dance that increases allies' attack power for a duration. This move consumes 80 durability. 11% STR, 55% DEX, 88% INT scaling. Certain enemies are weak or strong against different types of damage types. Critical: The damage bonus for backstabs and ripostes. Thrusting Swords and Daggers get an invisible bonus to critical damage as well. Durability: The health of the weapon. The effectiveness of the weapon will severely deteriorate when the durability falls below 30%. Weight: The weight of the weapon. Note that carrying over 50% of a character's Equip Burden will reduce the speed of their rolls, while going over 100% will reduce their regular speed to walking and attempts to roll or backstep will leave them momentarily stunned. Wielding a weapon without the required Strength and/or Dexterity will incur a penalty to the Physical damage of the weapon, while lower-than-required Magic and/or Faith will reduce the Magic damage of the weapon. Also keep in mind that a character gains a 50% bonus to Strength by wielding a weapon with both hands, thus reducing the actual Strength required. 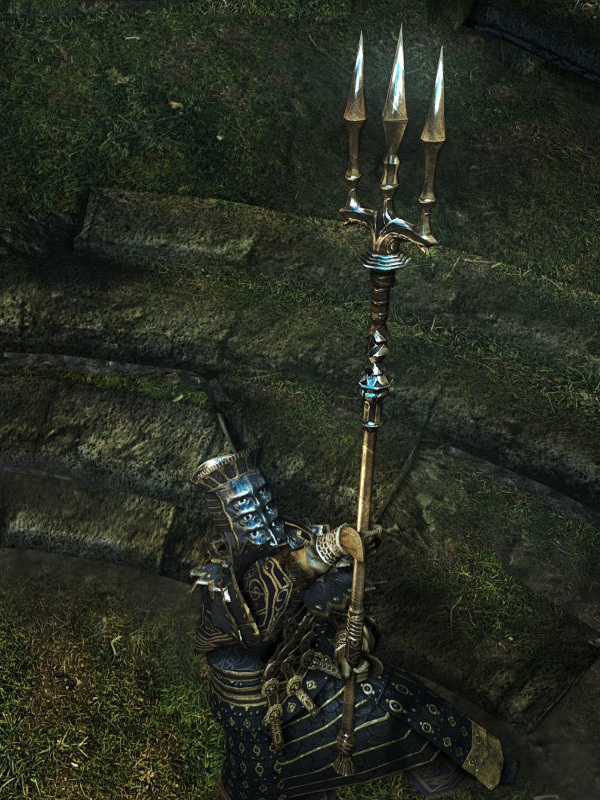 For example, a character with 18 Strength can wield a Large Club (Requires 26 Strength) properly if the weapon is held with both hands. Stability: The stability of the weapon. The higher this value, the less stamina is consumed when blocking attacks. Frampt Souls: This is the amount of souls players will receive if they feed the item to Kingseeker Frampt. How can I find it?